I’m sorry that I’m publishing this post half way through the month, friends! I usually publish my contemporaries to covet posts on the first Monday of the month, but this month I had a couple of interviews with the wonderful Manda Collins and Sarah MacLean that I wanted to get up right away. For those of you who are new around here, every month I let you know what contemporary romance novels coming out that month I’m most looking forward to reading. Leave a comment telling us what February contemporary romances you’re coveting, and you could win a $10 gift certificate for you AND the author. Giveaway details are below, but first here are the contemporary romances I can’t wait to read this month. Esa Saari is a hockey player for the New York Blades with a bad-boy rep both on and off the ice. But when he suddenly becomes the guardian of his eight-year-old niece, Nell, he knows his excessive lifestyle is about to get body checked. So he hires a live-in nanny. Her name is Michelle Beck, and she gets along great with Nell. What surprises him, though, is that he instantly hits it off with her, too. Getting romantically involved would be a bad idea, but he’s finding it impossible to ignore the intense connection between them. I love sports romances and, though I’ve never seen a hockey game (either in person or on TV), hockey players are among my favorite romance heroes for some reason. Oddly, despite my love for hockey heroes, I’ve never read a book by Deidre Martin, who’s written twelve books about a hockey team. It’s high time I give her a shot. Faith Holland left her hometown after being jilted at the altar. Now a little older and wiser, she’s ready to return to the Blue Heron Winery, her family’s vineyard, to confront the ghosts of her past, and maybe enjoy a glass of red. After all, there’s some great scenery there…. Like Levi Cooper, the local police chief—and best friend of her former fiancé. There’s a lot about Levi that Faith never noticed, and it’s not just those deep green eyes. The only catch is she’s having a hard time forgetting that he helped ruin her wedding all those years ago. If she can find a minute amidst all her family drama to stop and smell the rosé, she just might find a reason to stay at Blue Heron, and finish that walk down the aisle. I absolutely love Kristan Higgins’ books. She has just the right mix of humor and angst for me, making her one of my few autobuy authors. I’ll randomly choose one winner on Tuesday February 26th. That person will get a $10 gift certificate to the online book retailer of their choice, AND I’ll send the same to the author they mention. What contemporary romance novel(s) being released in February are you looking forward to? Have you read anything by the authors I mentioned? Which of their books do you like best? Winner of the Sarah MacLean giveaway! I have read and love both author. Will go for the Higgins book if I win. Look forward to both these books as well as Catherine Andersons. 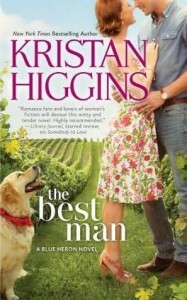 I SOOOO want to reat The Best Man by Kristan Higgins! That is the one book I most look forward to. I fell in love with her writing when I read my first book, Just One of the Guys, and it’s still my favorite book. It had EVERYTHING. Lots of romance and I laughed and cried throughout the book. I feel like a broken record when I say this, but, it would make an awesome movie! (hint, hint all you producers out there!) If you haven’t read it I HIGHLY recommend it. Wanda, I still haven’t read Just One of the Guys. I’ve heard so many great things about it and I’ve read most of Kristan Higgins’s books. I need to read that one! I haven’t read any book by author your mentioned. But those book sound greats and sweet!! The Best Man by Kristan Higgins was catch my eye. I have read both authors and like their books. I definately want to read Hip Check because I love Hockey and the stories. I also want Beautiful Bastards by Christina Lauren, Wolf Nip by Vivian Arend, and Die For Me by Cynthia Eden. I did pick up and read and loved Rush by Maya Banks. I definately fell in love with her writing and this story and will be eagerly awaiting the next in the series. Also picked up and loved Hot Tickey by Olivia Cunning. Love this series, love the characters, and dying for the next book of the series. It’s finally time for Kristin Higgins’ new book! It seems like I have been waiting forever. I love her style and often reread her novels, particularly “All I Ever Wanted”. I LOVE the scene early on it that book that takes place at the DMV. I haven’t read anything by Deidre Martin, but I do like sports romances. I’m currently reading Lisa Kleypas’ February release, Crystal Cove. It does have some magic in it, but it’s still a contemporary. So many great new releases this month! I would also add….The Night on Thistle Lane by Carla Neggers. It’s the second book in a new series. I am looking forward to Kristan’s new book, too! I have all over her books & absolutely love her writing style. I would say my favorite is The Next Best Thing or Just One of the Guys. It really is hard to pick a favorite, though! The contemporary that I am really looking forward to is Olivia Cunning’s HOT TICKET! I want to read The Good Daughter by Jane Porter, Crystal Cove by Lisa Kleypas, Rush by Maya Banks and Hot Ticket by Olivia Cunning. The contemporary that I want this month is Waiting for Love by Marie Force. This is book #8 in her Gansett Island series and I’ve enjoyed all of them so far and can’t wait to read this one. I’ve tried a couple of Kristan Higgin’s books, but they didn’t click with me. Still, The Best Man sounds really good, and I may have to give it a try – I love the “left at the altar” trope. I’m looking forward to Meg Maguire’s new Blaze book. Marie Force’s book is going to be great I’m sure I love the Gansett Island series but I think that I want to check out Deidre Martin’s hockey players and her new release 🙂 Thank you for sharing and giving us the chance to win!